We've all seen an intrepid investigator spray down a crime scene with luminol and turn off the light, and a seemingly innocent room glows blue, illuminated by the leftover traces of gore. This is usually a sign someone was horribly murdered in that room. But in reality it's also possible that they got into a food fight. The food fight would have had to include horseradish, that weird spicy relative of mustard that gets smeared on roast beef, but it also glows under luminol, just like blood does. So if you have some blood splatter you want obscured, you'd best have some stocked. 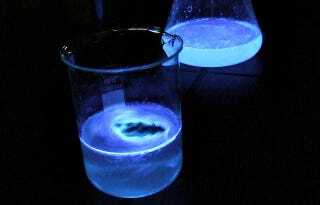 See, the glowing chemical in luminol is called 5-amino-2,3-dihydro-1,4-phthalazinedione. This mouthful of a compound has, in isolation, no need to change up its atoms. When it is in a basic solution, however, it has a tendency to shed nitrogen and hydrogen, and take on oxygen, but it still needs a push. A few different elements can push it, including iron. Hemoglobin contains iron, and so when the iron in blood makes contact with both this special chemical and an oxidizing agent that will donate the necessary oxygen, a reaction happens. This process changes 5-amino-et-cetera to a chemical called 3-aminophthalate, all the while releasing a little energy. This energy is present in the electrons of the 3-aminophthalate. When the molecule is created, they are placed in an excited state, but they eventually fall down to their base level, giving off photons as they go. It's this photon release that causes the glowing "traces of blood" at a crime scene. Of course, it wouldn't take forensic investigators long to separate the blood and the horseradish, and quickly realize you're a murderer, but maybe it'll buy you enough time to escape. Still, you probably shouldn't murder anyone anyways. Have a roast beef sandwich instead.